Changing lifestyle with the growing preference for customized and diversified packaged items is transforming the packaging industry. Rising health concerns among consumers is increasing the demand for the consumption of fresh food. Efficient and innovative packaging plays an important role in preserving the freshness and nutrition of food and increases its shelf life. Increasing inclination towards diverse and exotic food over basic staple food is boosting the demand for fresh food packaging European Union. Despite of significant level of awareness, over 55% of fruits and vegetables produced in Europe are wasted every year. This is raising environmental concern and increasing the need for effective fresh food packaging in the region. Moreover, growing awareness about global warming and its ill effects on environment is shifting the inclination of people towards eco-friendly material for fresh food packaging over conventional packaging. This is impacting the fresh food packaging market in Europe and manufacturers are shifting from conventional packaging material to innovative and environment friendly packaging. For instance, Field to Fork packaging design is growing popularity among consumers due to its smart, attractive and convenient packaging. Also, returnable plastic crates (RPCs) are gaining recognition, as it provides ease in transportation of fresh produce. Key vendors such as Amcor, DS Smith, International Paper Company and many more prefer are investing in R&D for innovative, renewable and sustainable packaging solutions for fresh food such as edible and water soluble packaging. In 2017, Mondi launched a water soluble film for smart and convenient packing which aims to reduce packaging waste. Growing demand of flexible packaging to increase the shelf life of fresh food is driving the growth of fresh food packaging market across the globe. Europe fresh food packaging market is anticipated to garner USD 11.40 billion by the end of 2024, growing at a CAGR of 2.23% during the forecast period. The U.K. accounted for nearly 17% revenue share of Europe fresh food packaging market in 2015. High consumption of fresh food in the region is likely to maintain the dominance of the U.K. over the forecast period. Rising stability of GDP, increasing health concerns and growing preference for ready to eat meals is expected to boost the demand for fresh food packaging in countries such as Germany, Sweden, France, the Netherlands and the U.K. 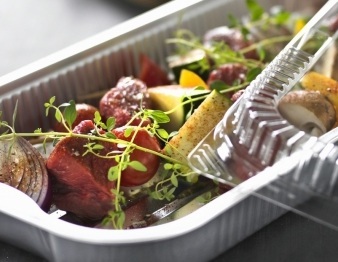 Rising disposable income and mounting demand for convenience food among consumers are driving the growth of the European fresh food packaging market. Moreover, growing awareness among consumers regarding the fresh food packaging is likely to encourage the business expansion of fresh food packaging in Europe in the near future. However, disposal of food waste at the time of packaging is a major concern for manufacturer of fresh food packaging. Increasing number of big and small enterprises and rising consumer preference towards cost effective and local products is creating competitive environment among leading brands in the fresh food packaging market. These factors are hindering the growth of fresh food packaging market in Europe. Sealed Air India Pvt. Ltd.
7.2.15. Sealed Air India Pvt. Ltd.